The International Monetary Fund (IMF) has approved a three-year loan of 22.5bn euros ($30.1bn; £19.2bn) for the Republic of Ireland. The funds form the first part of the IMF's contribution to the EU and IMF rescue package totalling 85bn euros being received by the Irish Republic. About 5.8bn euros of the IMF funds will be immediately available for Dublin. 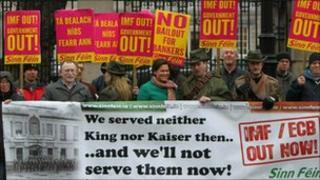 Irish MPs voted to accept the EU-IMF bail-out this week, as the government seeks to restore its finances. The Irish Republic is trying to reduce its high public deficit and large overall debt. It is also having to shore up the country's banks, which have been left with significant bad debts following the collapse of the country's property market. As a condition of receiving the EU-IMF rescue package, the Irish government has had to unveil substantial spending cuts, which has sparked a number of protests. The IMF announcement came as EU leaders agreed to set up a permanent mechanism to bail out any member state whose debt problems threaten the 16-nation eurozone. The eurozone stability mechanism will require a change to the EU's Lisbon Treaty - but the wording has now been agreed, diplomats say. Meanwhile, official figures from the Irish Republic have showed that its economy returned to growth between July and September, expanding by 0.5% on the previous three months.